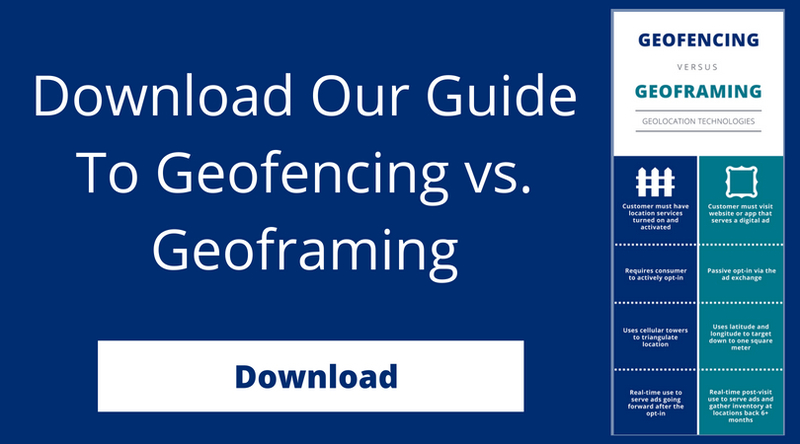 Geofencing vs. Geoframing: Who Wins? We use geoframing — not geofencing. • Your audience doesn’t have to opt-in to see your ad, they just need to go to a site or an app on the ad exchange that serves ads, like news, sports, shopping or social media. • We can be much more targeted than our competitors: Narrowing the area receiving your ads down to the square meter. Geo-fencing uses cell towers to triangulate and you get everything in that space — whether you want it or not. We use geoframing, keeping your ROI stronger as we get less “unwanted” devices. • Geofencing requires an active or hard opt in inside ads to receive ads. Geoframing only requires a soft opt in. Viewers are passively opted in via the ad exchange. • We can serve your ads to leads at your venue in real time, later when they get home — even go back in time to capture leads previously at your venue and serve them ads. Geo-fencing can only do real-time ad serves. • No beacons. We don’t use hardware, so there’s no install time, etc. It’s pretty obvious that geoframing is the winner, but let’s step back a little to define geofencing. Geofencing uses GPS or RFIDs to create a virtual boundary used by software to trigger a response when a mobile device enters or leaves a particular area. This gives you, the marketer, the chance to target these mobile devices when they are near a certain location. Geofencing is a cool technology; however, because it relies on cell tours it is limited to one specific area in one specific time. Geofencing is also push-notification based, which only finds the people who have the correct app and have opted in. While geofencing has been around for a while, technology is quickly evolving. Marketers need to keep up, and say hello to geoframing. Geoframing was introduced in 2017, and has the same idea as geofencing but takes it MUCH further. Basically, geoframing is the big brother of geofencing. They look the same, but the functionality is very different. Geoframing uses the latitude and longitude instead of using cell towers to focus down to a specific location. This is how it can narrow your ad area down to one square meter if you want. This gives the marketer a more precise location and takes out the people who are just passing through your geoframe. • Geoframing takes everything geofencing does and makes it more precise to the location and so much more. • Geoframing uses historical data, meaning a marketer can drop a net over a specific location and pull the device IDs that were in those locations dating as far back six months. Geoframing is a perfect way to target the right audience in real time and later at home and on mobile. Geoframing can do all this by taking that captured device and tying it back to the household address to serve future ads. The geoframe captures a device ID and tracks it for a few days. 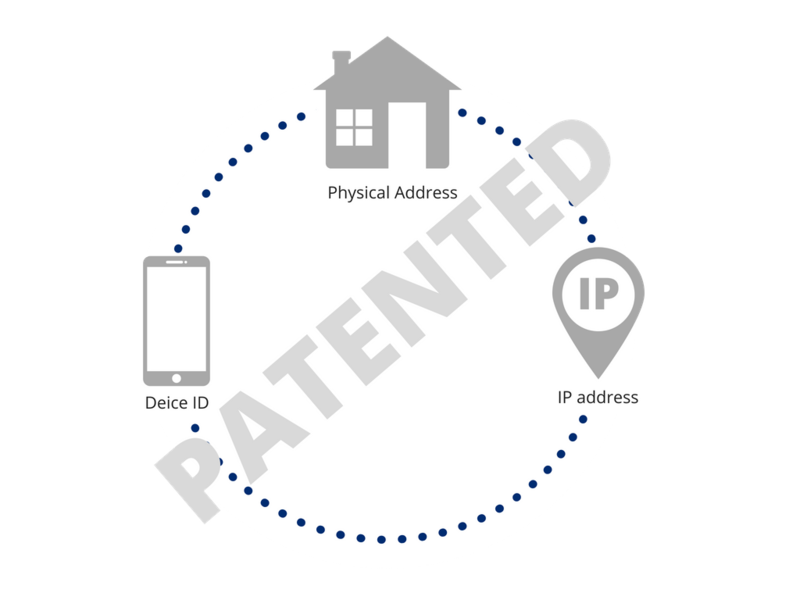 Almost everyone connects to multiple IP addresses every day so our geoframing technology tracks the device going from the coffee shop to home, to the store to home, and so on, until it is able to pinpoint what the most frequent IP address is to label as the household address. With this tracking, you’ve got a more accurate device capture, an expanded time frame, and online advertising on mobile and home devices. Now that you better understand IP Targeting, using geoframing is the clear winner and you can integrate it into your next campaign. Our 100% cookie-free system can help you get in front of potential customers with a new touchpoint. Maximize your ROI and ROAs with IP Targeting using geoframing. Are you ready to maximize your ROI with geoframing? Midwest Direct is ready to help with your Digital Post+ campaign. Contact us today.